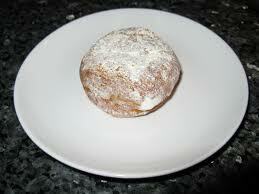 Have you ever had a fasnacht? They are wondrous culinary creations served warm, coated in confectioners' sugar or with King Syrup. You can feel yourself gaining weight and your arteries clogging as you eat one, but in the moment it just doesn't matter. Eating two in one sitting is bound to take years off one's life, but life is short anyway...so I figure have another. Traditionally fasnachts are only to be eaten on Fat Tuesday or, as I and many other central Pennsylvanians grew up knowing it, Fasnacht Day. But between mixing the dough, letting it rise, and deep frying, the process takes awhile. You have to make a lot in order for it to be worth the trouble. They can be frozen and then nuked in the microwave, thus our family happily enjoyed Mom's fasnachts for breakfast or dessert, or both, right through Ash Wednesday and on into Lent. I suppose it is apparent that while I was growing up my family was never part of a church troubled with strict observances of liturgical seasons. Lent for example was something that Catholics did. Later on I became aware that Lent is also something many protestants do. It took some time to get over my suspicions of a religious practice not specifically mentioned in the Bible. Then I realized pot-luck dinners are not specifically mentioned either. If there's no problem with occasional feasting then I suppose the occasional fast is acceptable as well. Still I like to try to be creative...or maybe I just enjoy food a little too much and thus prefer to fast from other things. Whatever the case I hereby submit a short list of things other than fasnachts or food in general that I could stand to fast from during and perhaps beyond Lent. 1. Cynicism comes in at number one on the list because it is exactly what I had to get past in order to even appreciate the value of Lent in the first place. Although it's part of my charm (and I am quite charming) my cynical attitude often leads me to write off things that might actually be of benefit...like say fasting or other spiritual disciplines I'm not used to. Worse cynicism sometimes leads me to write off people. That's just no good. 2. Free t-shirts have come easily over the years. Mission trips to Maine, New Orleans, West by-God Virginia, and Tennessee are represented. A variety of college baseball and football teams are in the mix as well as a minor league team or two and several high schools. In the attic is a pile of about 30 which makes packing for summer camp and mission trips very convenient. There are another 15 or so in a drawer in the bedroom, divided between random shirts and shirts for practices and workouts. I have a hard time saying no to free t-shirts. They're so darn useful and fun. But when the collection nears 50 it might not hurt to turn one down here and there. Maybe I'll start working on hoodies. 3. Sweating the small stuff is a technique I have perfected over many years of rigorous training. You may not see it...but my wife does. My attention to detail is particularly out of control in regard to the checkbook. As a result my wife has been conditioned to creep into the house very quietly upon returning from Target. She makes sure to tuck the receipt inside the checkbook so as to provide evidence that she really did buy nothing more than laundry detergent and dog food. No frivolous purchases...like extra scrubby sponges for cleaning the kitchen sink. Uh-uh. Straight necessities; nothing more. 4. Gardening. I'm not even concerned with whether I'll have the peas planted by Easter this year because I'm just not bothering at all anymore. Too much shade, too much clay, a dog that pees all over everything, and pesky underground varmints make for a yard that is not conducive to plant life. I'm focusing solely on the flower beds this year. Our veggies will come from the farmers' market...just like they have the past several summers of failed gardening attempts. 5. Complaining about what I don't have is one thing I need to stop, because I have been blessed beyond measure. I don't have a yard conducive to plant life, but I have a yard sufficient for chasing lightning bugs at dusk in early summer. There's a stream running along the back edge of the yard as well. That's pretty cool. My dog pees all over the yard, but never in the house. Our cars break down, but we have two. They almost never break down at the same time. I have a wife who tolerates me all the time and loves me most of the time, which I don't deserve. We have two healthy kids. We have everything we need and a few things we want. God is good. 6. Taking myself to seriously makes life a lot less enjoyable. Thus there will not be too much, or anything for that matter, riding on whether or not I'm able to perfectly abstain any of the above. I haven't made any bets with anyone or assigned any particular consequences for failure. It certainly does not mean the end of the world spiritually if I break down and actually attempt to clear the garden or accept a t-shirt in the next few weeks. But if I'm able to have a little bit of success with some of my Lenten fast then chances are I'll just be a little bit more lighthearted and perhaps more fun to be around as well, because ultimately I'll be free from some of my own self-imposed burdens. Now, pass the fasnachts! Older PostSon of God: Skip the Movie. Read the Book.